We are watching our next storm system track out of the Ark-La-Tex into the Tennessee Valley and up the western side of the Appalachian Mountains. This is a warm track for us, so I expect the majority of precipitation to fall as rain. This will not be a significant rain maker with the best forcing passing to our north and west. With that being said, we will have to watch for some precipitation to break out well ahead of the main storm system early Sunday morning. We will not have a strong high pressure system over eastern Canada that would usually cause a CAD(cold air damming) event along the eastern side of the mountains, but this current cold air mass may still struggle to erode the area completely by onset. 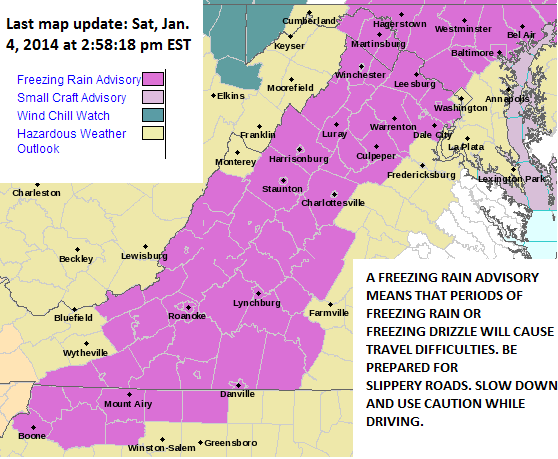 Depending on how early precipitation starts Sunday morning, there may be several hours of freezing rain. Temperatures will eventually warm enough during the day Sunday that everyone goes above freezing. The storm will pass during the early morning hours Monday and the trailing cold front will bring in the coldest weather we have seen in quite sometime. Northwest winds will pick up during the day Monday, allowing cold air to surge in and temperatures to crash throughout the day. Lows Monday night will be close to record breaking for many. Below is the 12z gfs forecasted lows. Areas along and west of I-81 will have a decent chance at dropping to below 0 degrees, while areas along the coast may even get down into the mid 10's. No where in Virginia will get above the freezing mark during the day on Tuesday. Highs will be in the 10's across western VA, and 20s for central/se VA. IF you typically have trouble with frozen pipes, be sure to take precautions. It will also be a good idea to be sure that any outdoor pets are brought in/check on elderly/don't make kids wait at bus stop/etc. Temperatures will slowly moderate on Wednesday and Thursday before our next storm potential towards the end of the week. *Freezing rain will change to rain during the day on Sunday, but watching for the possibility of some back end snow as the cold front swings through. It's usually hard to change rain over to snow along cold fronts in our area, but this arctic air mass may work in quick enough to do just that.